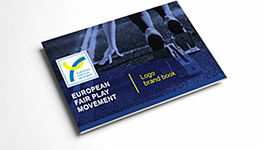 The European Fair Play Awards have been established by the European Fair Play Movement (EFPM) with the aim of publicising and promoting the principles of Fair Play in Europe, and are made in recognition of services rendered by recipients over an undefined period – excluding the year in which the EFPM Executive Committee makes and presents the relevant Awards. or: for making an outstandingly sportsmanlike gesture or acting in an outstandingly sportsmanlike manner during a sports event. A maximum of one European Fair Play Plaque of Merit and Diploma will be awarded in each of the two categories listed above (i.e., a maximum of one for an organisation and one for an individual). an organisation, as defined in paragraph 1.1 above, or to an individual, in consideration of a relevant contribution made by this organisation or individual to the preservation or implementation of ethical values in sport. The number of European Fair Play Diplomas to be awarded will be determined by the Awards Committee. A maximum of two will be given annually, depending on the quality of applications received. and must be submitted to the EFPM Secretariat so that it reaches the Secretariat before the deadline, which is to be fixed by the EFPM Executive Committee for each year. Decisions as to which persons, groups or institutions are to receive the above- mentioned Awards will be taken by the EFPM Awards Committee, and will be announced at the annual General Assembly of the EFPM. The Awards will be presented by the EFPM during the annual EFP Congress – or by the organisation that has submitted the relevant proposal, at its seat. • Work carried out with children and young people which aims to educate them in subjects such as Fair Play, tolerance and the discouragement of discrimination, and to help them better understand these values. Proposals may be submitted by individuals, by sports federations, or by public or private institutions. If submitted in a language other than English, the said report must include a brief English summary. A written version of the initial report (accompanied by photographs, videos and if necessary other relevant supporting material) should then be sent by post to Ioannis Psilopoulos, EFPM General Secretary, at the following address: 31, Kodringtonos Str., GR-10343 Athens, Greece. The deadline for submissions to reach the EFPM General Secretary is 31st March in each year. Decisions as to who will receive EFPM ‘Spirit of Fair Play’ Awards will be taken by the EFPM Awards Committee, and will be announced at the annual EFPM General Assembly. The making of Awards in this category is entirely at the discretion of the EFPM. Awards will be made only if the Awards Jury receives suitable proposals on behalf of candidates who are considered by this Jury to be worthy of an Award. The target group for the EFPM ‘Fair Play Flame’ Award is young people up to the age of 18 (this figure being calculated according to the year in which the candidate turns 18). • Actions taken at public events, or the organising of public events, which are designed to preserve or enhance the environment. It is, of course, participants themselves who are to choose the exact type of activity they wish to organise – the one they feel is the most appropriate and the one most likely to light the flame of friendship, tolerance and togetherness. Proposals may be submitted by individuals, by schools, by classes, by sports federations, or by public or private institutions. Decisions as to who will receive EFPM ‘Fair Play Flame’ Awards will be taken by the EFPM Awards Committee, and will be announced at the annual EFPM General Assembly. 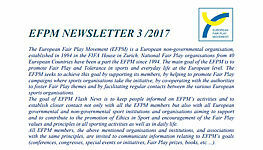 It is recommended that two (2) ‘Fair Play Flame’ Awards should be made annually – one reflecting the public’s choice plus one decided on by the EFPM Executive Committee. The making of that Award which is to be decided on by the EFPM Executive Committee is entirely at the discretion of the EFPM. This Award will be made only if the Awards Jury receives suitable proposals on behalf of candidates who are considered by this Jury to be worthy of an Award. 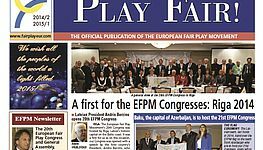 This is a great opportunity to involve the general public by allowing not only participants in the annual EFP Congresses and EFPM General Assemblies, but also visitors to these Congresses and General Assemblies, to vote for their favourite Fair Play project in the ‘Public’s Choice’ category. An exhibition presenting all the projects submitted for Awards is to be organised during each EFP Congress and EFPM General Assembly so that both participants in these events and visitors to them can vote for their favourite act of Fair Play. However, the most important reward for those teams, classes or individuals who receive these Awards will be the gratitude of those people who have benefited from the acts of Fair Play and tolerance concerned. The EFPM ‘Fair Play Vox’ Award is designed solely for institutions and companies involved with the printed, broadcast or electronic media, and for the people who work in them (for example, journalists and reporters working for newspapers, magazines, television channels, etc.). It is made in the knowledge that the media play a key role in encouraging society to adopt positive ethical values and in promoting general acceptance of the values of Fair Play and tolerance. • organising or promoting activities designed to ensure better physical and/or emotional health for children and young people. Proposals may be submitted by individuals, by schools, by classes, by sports federations, by public or private institutions, or by mass media institutions. Decisions as to who will receive EFPM ‘Fair Play Vox’ Awards will be taken by a Jury consisting of two EFPM Executive Committee Members and one representative of AIPS Europe, and will be announced at the annual EFPM General Assembly. The Awards will be made in co-operation with AIPS Europe during the annual EFPM General Assembly, or during the AIPS Europe General Assembly, or during an event specially organised by the two aforementioned parties. The making of Awards in this category is entirely at the discretion of the EFPM and AIPS Europe. Awards will be made only if the Awards Jury receives suitable proposals on behalf of candidates who are considered by this Jury to be worthy of an Award.